The Red Sox today announced their 2006 schedule and ticket prices, which represent a 5 percent overall increase from 2005. The team, which will open the season in Texas on Monday, April 3, will keep prices the same for about 70 percent of tickets. 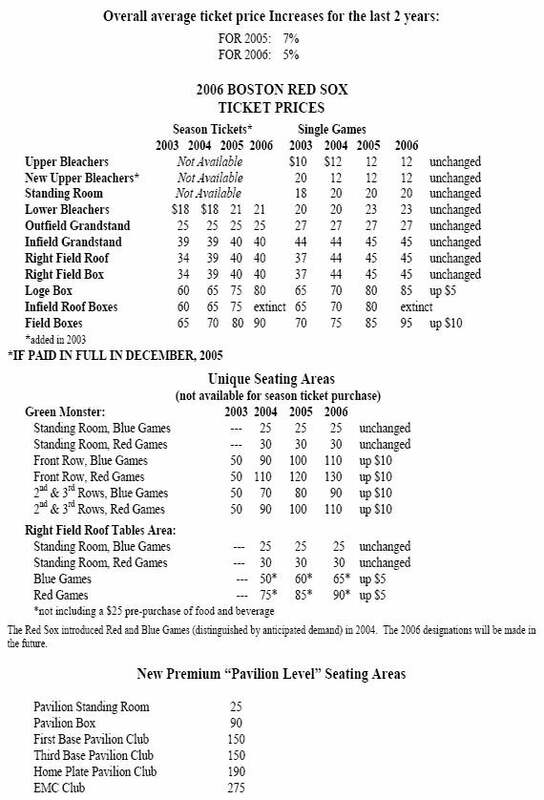 Good news for Average Joe Sox Fan: The team kept single-game ticket prices at 2005 levels for the nine cheapest areas of Fenway Park, including all bleacher seats, standing room, and infield and outfield grandstands. The cheapest ticket at the park is still a $12 seat in the upper bleachers. Ticket prices will increase in four ticket categories: the field box, loge box, Green Monster (a $10 increase), and right field roof tables. All prices are listed below. The prices will again range from $12 to $95 (not including premium seating areas). The Red Sox said they will also continue their policy of offering special $7 tickets for active military personnel. “Despite having had our second consecutive season of sellouts, we are holding the line on the vast majority of ticket prices,” Red Sox president Larry Lucchino said in a statement released by the Red Sox. “The overall percentage increase, about five percent, is similar to 2004, the two lowest price increases in more than a decade, and it is far less than the double-digit increases in the six seasons that preceded the arrival of the new ownership in 2002. The Red Sox also announced prices for the area that will replace the enclosed .406 Club behind home plate, which is currently being renovated and will be a mostly open-air section. The team said today that the new “pavilion level” was one of the reasons why the club can keep most ticket prices the same for 2006. Breaking down the schedule, the team starts with six games on the road in Texas and Baltimore, before opening up at Fenway on Tuesday, April 11, at 2:05 p.m. against Toronto. That game begins a nine-game homestand against the Blue Jays, Mariners, and Devil Rays. Unlike this season, when the Red Sox and Yankees squared off six times in April, the rivals won’t meet until May for the first of their 19 regular-season encounters. The first series between Boston and New York will be contested at Fenway May 1-2. Just over a week later, the Sox head south to the Bronx to meet the Yankees from May 9-11. Then it’s back to Fenway for a three-game set May 22-24, and they’ll finish the busy stretch in New York June 6-8. Oddly, none of these games takes place on the weekend. Boston’s last five games of the regular season will be played at Fenway Park: two against the Devil Rays (Sept. 29-30) and three against the Orioles (Oct. 1-3). The Red Sox will take on teams from the NL East in interleague play in 2006. On the road, they’ll face the Phillies (May 19-21), Braves (June 16-18), and Marlins (June 30-July 2). At home, they’ll take on the Nationals, Phillies, and Mets during a nine-game homestand from June 19-29. 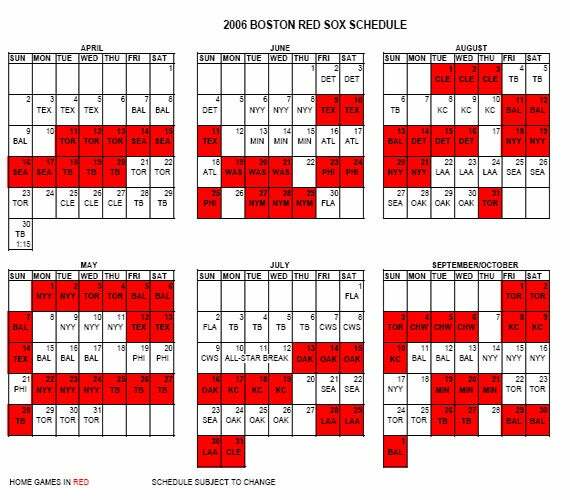 The Red Sox are home on Mothers Day, away on Flag Day and Fathers Day, away on Independence Day, and home on Labor Day. The Red Sox will soon announce game times as well as the dates when “Sox Pax” and selected single-game tickets will go on sale. Background information from the Boston Globe was used in this report.